Even though it takes time, which is something I have in very, very small quantities, I love personalizing my devices. For years I stuck with my devices library of images - until my favorite green grass background disappeared from my iPhone. How dare they!!! That was my Spring and Summer image! From that moment on, I began taking a teeny tiny bit of time every few months to download seasonal images and find something that fit my mood and my screen. How better to personalize than with art from my favorite picture books?! I smile every time I open my laptop ... or, rather, every time I minimize the ten thousand windows I have open at any given moment, then I smile because no matter the season, something inspiring or adorable or lovely is looking out at me. Carry the new release, Violet and the Woof, with you everywhere with these free wallpapers! Made for iPhone, iPad, and desktop/laptop, you can smile every time you unlock your device. 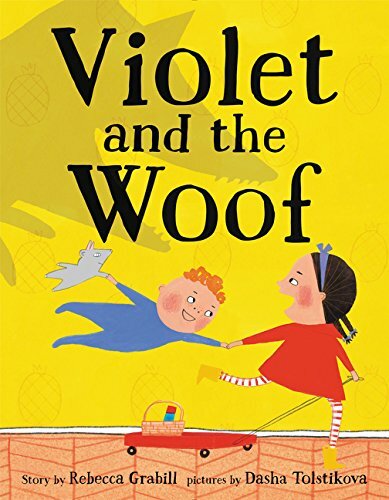 Wallpapers for Violet and the Woof! Right click to download this free Violet and the Woof desktop/laptop wallpaper! Long tap and save to camera roll to use this free iPad wallpaper! Violet and the Woof iPhone background! Another full-sized wallpaper to enjoy Violet and the Woof on your device all day long! Enjoy! I hope sweet little Violet can make you smile all day long. It just occurred to me to set this as my daughter's iPad background too! She's going to LOVE it!